The DataMan® 8070V series verifier is packed with powerful lighting options, robust grading algorithms, a high-speed processing engine, and a high-resolution camera to capture and grade the most difficult DPM codes. As the only DPM verifier on the market with 30-, 45-, and 90-degree lighting options, the DataMan 8070 verifier can easily illuminate codes on textured, curved, and even highly reflective surfaces. DataMan 8070V verifier is the only verifier with all three, 30/45/90-degree, lighting angle options specified in the International Organization for Standardization (ISO) AIM DPM Quality Guideline (ISO/IEC TR 29158). 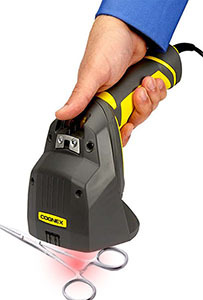 It easily illuminates codes on textured, curved, and even highly reflective surfaces, reliably capturing and grading code images to demonstrate code quality compliance. High-speed location and decoding capabilities combined with robust grading algorithms provide fast, accurate, and repeatable results. Detailed reports show whether codes meet industry standards and can be used to demonstrate compliance, as well as pinpoint printing and process control issues. The DataMan 8070V series verifier has an ergonomic, handheld scanner-like design that is easy to maneuver. A small imaging head gives users better access to codes in recessed or hard-to-reach locations. The DataMan 8070 verifier is the only verifier on the market with an IP65 rating and rugged housing to withstand even the harshest factory floor environments.